Dubai, UAE, April 12, 2018: Showered? Tick. In a rush? Double tick. Planning to moisturise? No way! Not when you’ve got jeans to fit into and ten minutes to get out the door! Life’s too short for waiting. Which is why NEW fast-absorbing Body Yogurts take just 15 seconds to absorb into your skin. Finding time in our busy schedules to take care of our skin is hard, right? Well, now just 15 seconds a day is all it takes for a healthy-looking glow. What makes Body Yogurts so special? The refreshing gel-cream formula sinks into damp skin in seconds, providing 48 hours of lightweight moisture. Which means you can go from shower to jeans (or pyjamas) in 15 seconds. It’s perfect for a morning or night routine, and is ideal for balmy summer days when you don’t want a sticky finish, or drizzly winter days when you can’t wait to get into your warm flannels. Added bonus: it gives your skin a healthy looking, year-round glow. Available in Strawberry, Mango, Almond Milk, Coconut, Moringa, British Rose and special edition Banana, you won’t be able to resist spooning it on. “When I’m in a hurry, I sometimes struggle with thick moisturiser as it can feel wet and uncomfortable on my clothes. 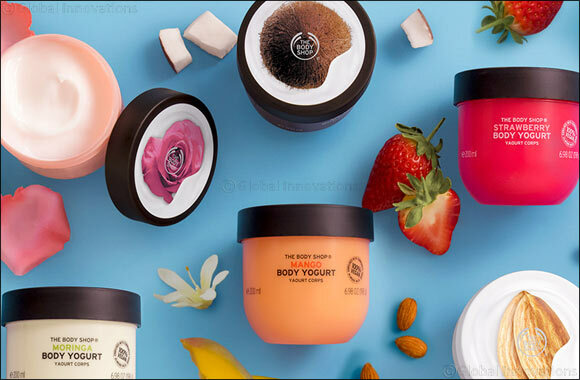 My favourite thing about The Body Shop Body Yogurts is how the gel-cream texture instantly absorbs into my skin, giving it a silky ultra-sheer veil of hydration without feeling thick and greasy. The Moringa, British Rose and Banana Body Yogurts are also enriched with their own Community Trade ingredients – which are exciting new additions to The Body Shop’s unique Community Trade programme. The Body Shop Community Trade moringa extract comes from Rwanda, Community Trade English rose essence from Herefordshire, and Community Trade organic banana puree is from Ecuador.